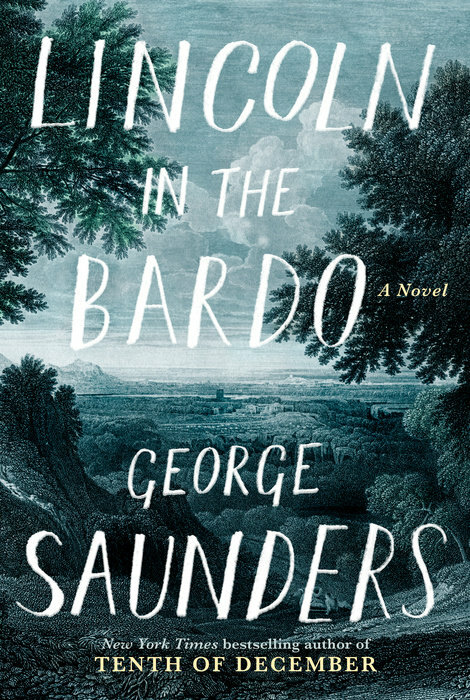 If Hieronymous Bosch's painting, "Garden of Earthly Delights," cross-mojonated with Dante's Inferno and Team of Rivals, it would amount to Lincoln in the Bardo by George Saunders. I had my moment reading old white guys who play with literary form in graduate school, but I left that reading behind some time ago. Even though I was afraid that's what I was going to get with this novel, it was much better than some intellectual circle jerk. It was playful in its form, and it was quietly ambitious, and it did make me roll my eyes a time or two, but it was good. It was five-start, all-time fave good. I think I probably have the audio performance to thank for that. Backing up just a bit, the novel takes place over one night after the interment of Abraham Lincoln's 11-year-old son, Willie, who died of typhoid. Willie is stuck in the transition from life to afterlife, and that's not a place most children end up. As our narrators make clear, "These young ones are not meant to tarry." Willie is surrounded by a cast of characters--and I do mean CHARACTERS--like Mr. Bevins (David Sedaris), a young suicide, and Mr. Vollman (Nick Offerman), a printer who was killed in a freak accident before consummating his marriage. All of the lingering spirits are perpetually focused on the things they were perpetually focused on in life. Whether they were victimized, obsessed, brutal, tortured, or aloof, they are much the same in death. But...worse. For the most part, they don't know they're dead...serious denial...but they do know that at some point, some of them go on. Somewhere. 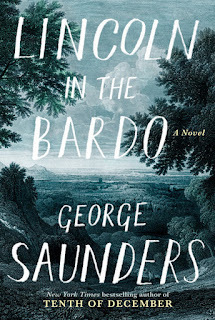 There are a grand total of 166 readers in the audiobook production, and I was almost certain it would make my head spin, but that's where Saunders' attentions to form comes in. The narrative is fragmented in such a way that really worked for me. Some chapters unfold in a very traditional narrative and are told almost exclusively by Vollman, Bevins, the Reverend Thomas (George Saunders) Willie, President Lincoln, and others of the spirits. Other chapters are historical (actual historical and completely invented) snippets that tell of the night Willie died, what life was like in the White House, how the Lincolns reacted to their son's death, how the funeral unfolded, how Lincoln was perceived as a president, and lots more. It was easy to sink into the rhythm of the book, and it was actually enjoyable to experience all the voices. It gave the story an expansive, blooming effect as each chapter added a bit more to the overall picture, and it felt weighty with history and emotion. And that ending. But I'm not telling you WHAT about that ending. If you're on the fence, take the plunge. If you hadn't been interested until now, snap it up! This was so great!! I am so glad I listened to it!! Me too! Perfect fit at the perfect time. I already put this on hold because of your tweets. I'm really looking forward to listening now. I can't wait to hear your thoughts on it! Good to see you! It was such an experience on audio. I don't think I would've enjoyed it nearly as much if I'd read it. Would've had too hard a time differentiating many of the voices in my head. Good stuff! Now I want to read the rest of Saunders. I'll be thinking about this one for a LONG TIME, I know; I can hardly imagine reading it, though, after having listened to the audiobook. It was absolutely magical! I'm not sure I've ever had an audiobook experience that felt this meaningful; definitely one of my faves this year. Yessss! So much to ponder, enjoy, remember. I know I haven't had an audiobook experience as touching as this one in a while, and maybe never with fiction. I convinced my book club to select it for this year's reading list so I am so happy! BUT, I am not reading it until late this year. Bah! I'm so excited you'll get to discuss it with a group! I bet it'll be a colorful discussion. Thank you for your great review, Andi. I am new at blogging but will get the hang of it.I've been on the fence, yes...the 'Tenth of December' did nothing for me. Your review changed this, of to the store. Sounds great!